The reels have barely quit spinning from the last big progressive jackpot win at Slotland and it’s been hit again already. A player known as “JJJUNIPERJJJ” has just won $85,873 playing the new Reel Riot slot machine. The last big jackpot winner was less than a month ago when a retired grandmother won $175K playing video poker. Slotland’s 3D casino, WinADay.com, has a separate progressive jackpot of its own. The jackpot there, where the new video poker game Deuces Wild was just launched, is currently nearing a record-breaking $180,000. Slotland.com has fifteen one-of-a-kind slot machines and video poker games. They are all instant play casino games so there is nothing to download or install. Six of the most popular games are also available on mobile phones and PDAs. 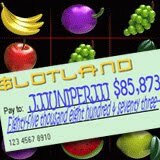 All of Slotland’s slot machines, including the mobile versions, are tied to one progressive jackpot which was reset to $50,000 after this win and is now over $60,000.